The E Brook rises in Sutton Park and flows out of the Park near Town Gate. The late Dennis Hurley speculated that, say 5,000 years ago, the broad flat valley between Manor Hill and Mill Street was a marshy morass, the E Brook following a course parallel to Park Road and not joined by the Longmoor Brook until the present Lower Queen Street bridge. Then, possibly 2,000 years ago, a causeway was thrown up across the valley on the line of Clifton Road, creating a pool fed by both brooks. This pool, named Cross Pool, was a fishery in the Middle Ages, later it was drained, and then in 1868 Job Cole created the Royal Promenade Gardens, making the present pond near the Youth Centre as an ornamental feature. By 1100 another, larger causeway had been constructed across the valley along the line of the Parade and Lower Parade. This causeway dammed the brook, creating a large pool extending from the Gracechurch Centre almost as far as Clifton Road. Water from this pool powered Sutton’s water mill which had the milling monopoly - all the grain grown in Sutton was milled there until the sixteenth century. On July 24th 1668 Sutton was hit by such heavy rain that flood waters swept out of Sutton Park and over the dam, severely damaging the mill. Some repairs were undertaken, but the mill never fully recovered. The dam had a low stone parapet, as Zachariah Twamley recalled “when I was a schoolboy (1780s) I have had many a run along the top of it”, and he reported that stones from this were used to make “Peats Bridge to carry the road over the He Brook”. The pool was drained, but a small flow of water still trickled past the old mill, now converted to processing leather. As the town developed in the Victorian period the brook began to be choked with sewage and rubbish, giving rise to dreadful smells along the newly developed Parade. Proper sewers were laid in 1890 and the stream bed tidied up, but the South Parade area and the meadow on the site of the former mill pool were still liable to flooding, a problem not resolved until the brook was straightened and deepened in the 1960s. Although culverted under the railway and channelled round the edge of Queen Street car park, the E Brook’s pure waters still bring mallard and wagtails into the centre of the town. Cross-section through the Parade showing the original height of the dam and the water level of the mill pool, compared with the 1994 levels, calculated by Dennis Hurley, June 1994. 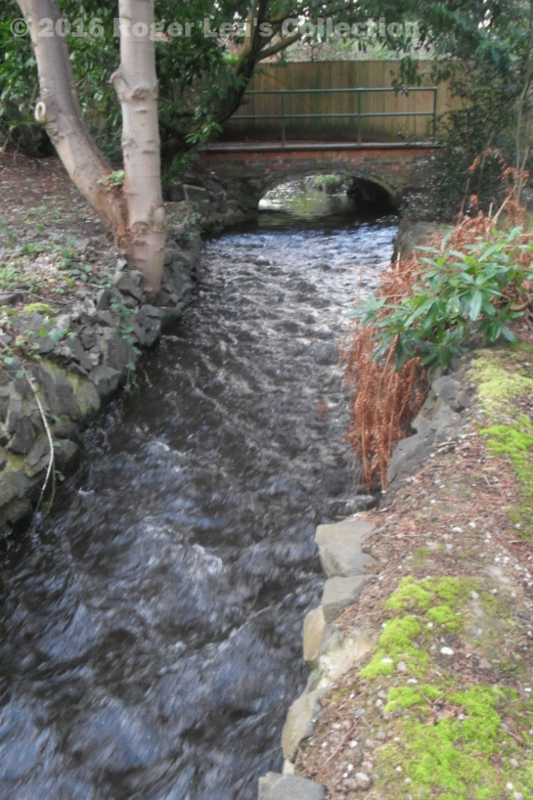 The E Brook in its artificial channel near Manor Road.